This all started because I had a bunch of American Airlines miles/points that were about to expire. I didn’t have enough for a ticket to anywhere, but I had plenty for lots and lots of magazine subscriptions. Which is why I get Entertainment Weekly on a, well, weekly basis. In the last issue I read (which may not actually be the most recent issue since our coffee table has a towering pile of magazines that I flip through here and there) I saw an ad for a free Graze box.I like snacks, and I like snacks that are delivered to me for free (ish), which means I don’t even have to go anywhere. For $6, Graze sends a box of 4 small snacks (around 200 calories each, more or less) to you at a frequency you set. The default is every 2 weeks, which sounds about right for a special snack a couple times a week. It comes to $1.50 per snack, which is more than the vending machine candy bar, but then you don’t get the pleasure of receiving mail AND nibbling at a semi-healthy snack. 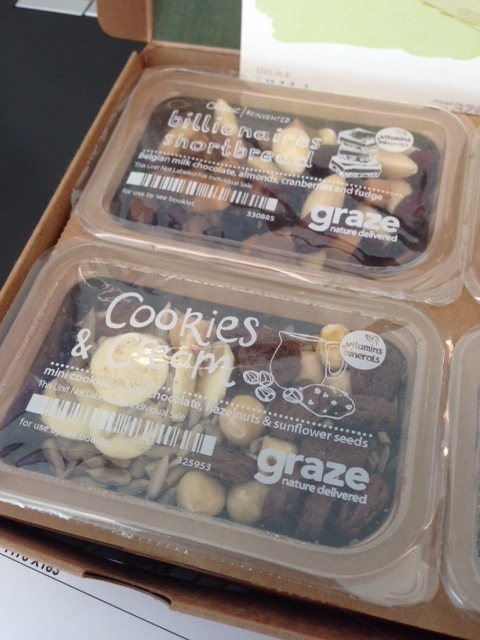 Once you sign up for your first box, you can go through and rate all the snacky products Graze offers. If you want more chocolate, you can rate it “Like” or “Love” and it’ll go into your rotation more often. “Try” means you’re willing to try it at least once, and “Trash” means you don’t ever want to see it taking up precious snack space. There are dippers, flapjacks (they look like granola bars), savory snacks, fruit snacks (dried, not gummy), nuts, seeds, and snacks with bits of chocolate. As you receive and try the snacks that are sent, you can go back and update the ratings for future boxes. I was in need of a little chocolate fix, so I started with the Cookies & Cream. While I think sunflower seeds are fiddly to eat, I appreciate the seedy protein they add to a snack. Between the white chocolate and the chocolate cookies, it was just sweet and chocolatey enough for me, and the nuts made it feel like a substantial snack. I’m looking forward to the crouton-y looks of the Pomodoro Rustichella and the fudgy pieces in the Billionaire’s Shortbread. I like the sound of soy sauce pumpkin and sunflower seeds, but we’ll see if eating a small box of sunflower seeds is too fiddly for me. I’ll either pick at it all day or just dump the whole thing in my mouth at once, which would end the snacking much too quickly. Because I’ve put on some pounds over the last few years, in addition to a very merry holiday season, I’ve been tracking my meals and snacks with My Fitness Pal and dusted off the Fitbit (if you would like a Fitbit friend who will make you feel good about your step count, you can add me since my numbers are not impressive at all). There’s a bar code on each snack pack and I was curious to see if scanning it with the My Fitness Pal app would bring up the nutritional value. And, it does! So, that makes tracking the snacks even easier! In the end, I don’t know if I’ll keep up the frequency of a snack box every 2 weeks, but I do think I’ll keep ordering more boxes, if only to try more of their snacks. I can easily carve out $6 from my budget and I’d rather have a fun, new snack than nibble through a bag of chips. 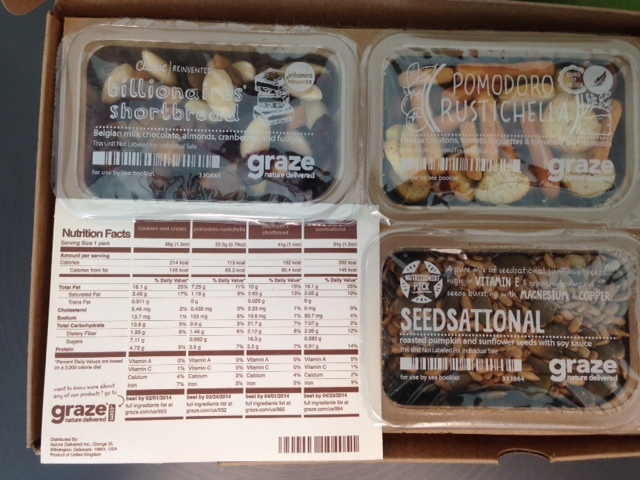 If you would like to try a Graze snack box, I have a referral code that gets you your 1st and 5th box for free! It also gives me $1 for anyone who signs up through it, but I think you should give one free box a try anyway. 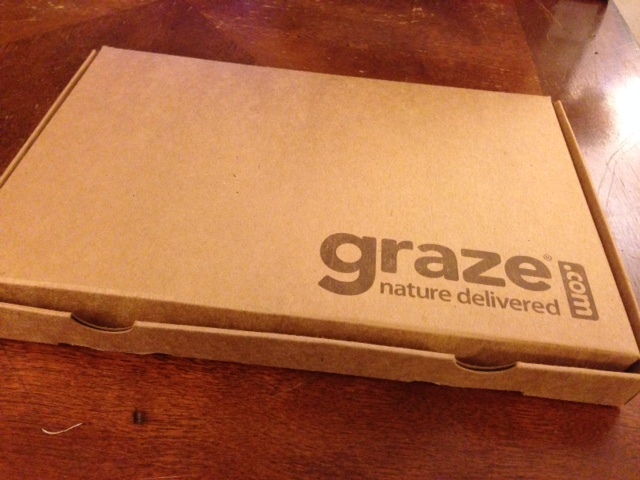 This entry was posted in food, nifty and tagged graze snack box, snacks. Bookmark the permalink. How cool! I like the packaging of the snacks, too. It’s cute and who doesn’t love mail? I used to get this other box that cost $7 a month with a whole bunch of weird snacks in it (some good, some not) but they shut it down. I’ve been browsing for something new and reasonably priced to try, so I think I’ll give this one a shot! I love getting mail, and I love getting snacks, so getting snacks in the mail is pretty awesome to me. You should try it! Your first box is free and you can cancel before they ship the next one if you don’t like it, so what could you lose? I like that I can pick out individual snacks I don’t want before they send them – like, I don’t want a tiny portion of chips and salsa taking up room in my snack box. Haha! I like the idea of dumping all the sunflower seeds into your mouth. Maybe because my mouth is so big and sunflower seeds are made for birds with tiny mouths I want to display my dominance. But I think I need to try this and see if I still have some will power left. I always start eating sunflower seeds a few at a time, since I’m sure that’s how you make a snack last longer. But then I get impatient and just dump them into my mouth. At least with the Graze boxes, there’s a finite amount of snacking you can do at one time. So far, I’ve been very good about managing my snack intake and fitting into my food allowance (more or less). You can still get your first and fifth box free using this link.